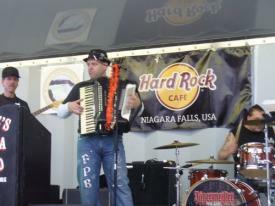 Mike and Tom are shown here during FPB's gig in Farmington, NY on March 15, 2011. 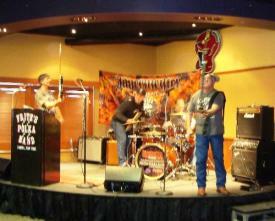 Frank, Fritz, and Mike are pictured here during FPB's March 15th gig at Finger Lakes Gaming & Racetrack. Fritz's Polka Band is shown here with members of the Leadership Mohawk Valley Class of 2011 (of which Fritz is part of!) at the conclusion of FPB's March 5th gig at the Utica Maennerchor. Frank tears up the dance floor with Kelly Murer during FPB's gig at the Fasching Night event on March 5, 2011. Fritz hams it up for the camera, along with his buddy, Brandon Lovett, during FPB's gig on March 5th. Tom and Frank are pictured with Ann Rushlo during FPB's gig on March 5th at the Utica Maennerchor. Fritz poses with his friend, Ann Rushlo, during FPB's gig at "Fasching Night" on March 5th. Gabe is pictured here during FPB's gig on March 5th in Marcy, NY. 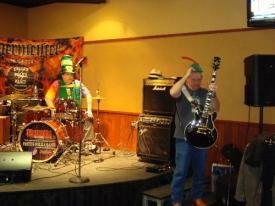 Fritz in his costume for the FPB gig during "Fasching Night" on March 5 in Marcy, NY. FPB cranks out a tune during their gig in Marcy, NY on March 5, 2011. Fritz's Polka Band tearing through a tune on March 5, 2011 at the Utica Maennerchor during the "Fasching Night" gig. Fritz's Polka Band tears through a tune on March 5th in Marcy, NY at the Utica Maennerchor. FPB drummer, Mike Faraino is pictured here in his costume for the FPB "Fasching Night" gig at the Utica Maennerchor on March 5, 2011. FPB is pictured here during their last tune of the gig on January 25th in Farmington, NY. Quite a balancing act, eh? 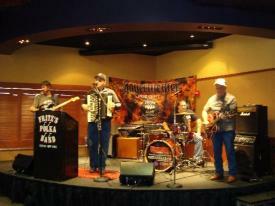 Fritz's Polka Band is shown here during their January 25, 2011 performance at Finger Lakes Gaming & Racetrack in Farmington, NY.